#G0400* – UKIP entering fray in North Down c/o Michael BOWER’s Blog! A constituent of mine has drawn my attention to the below leaflet which he received posted through his door in the Abbey area of Bangor yesterday. Firstly I totally disagree with UKIP’s narrow minded view of immigration and the EU. To basically label immigrants as people who simply drain our public resources is abhorrent and neglects the important role that immigrants play in helping support public service delivery eg as doctors, teachers, nurses, police officers etc and in helping support our economy eg shop workers, cleaners, entrepreneurs. We even have in Northern Ireland an immigrant as an MLA and a very fine one she is too! Bangor and North Down generally have good race relations with a number of very active ethnic minority community groups. The emphasis needs to be on helping support immigrants to adapt to life in Northern Ireland and to integrate them into our local communities. 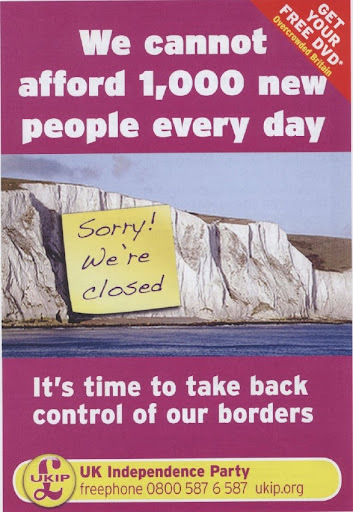 UKIP’s “close the door” mentality only inflames tensions; appealing to people’s fears rather than reality. 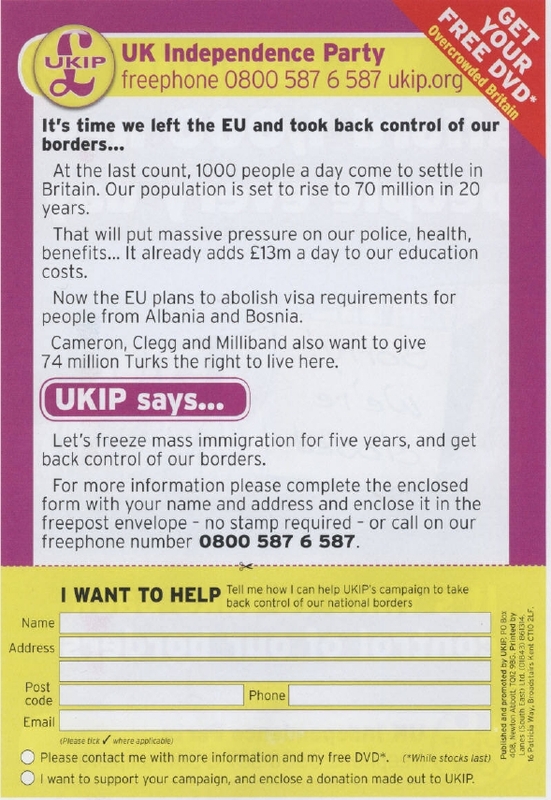 Secondly the leaflet demonstrates just how much commitment UKIP has to Northern Ireland. The White Cliffs of Dover – hardly a symbol that many people in Northern Ireland will identify with! It also refers to 1000 people a day coming into Britain to settle. Last time I checked Northern Ireland wasn’t in Britain, it was in the United Kingdom of Great Britain and Northern Ireland. A local UKIP member has simply handed out the same leaflet here as I am guessing that they delivered in Buckinghamshire in last year’s Westminster election. I’m sorry but if you are serious about making gains in Northern Ireland then you are going to have to work harder than that. UKIP will no doubt try to present itself as a “non-sectarian centre-right unionist party”. Although these “non-sectarian” credentials can seriously be drawn into question given their previous dalliances with the TUV. Whilst I have been out delivering leaflets introducing myself to the people of Abbey and informing them what their local Alliance team is doing and what help we can offer them, UKIP is delivering leaflets designed to inflame tensions about immigration with no mention of who they are locally or what they are offering local people. Northern Ireland has suffered from being a rather insular society. I welcome those coming to settle here with fresh perspectives a different world views. Reminding us that the world is bigger than Northern Ireland can only be a good thing. I felt compelled to respond but refrained from pointing out that if he aspires to politics he had well be minded that Northern Ireland is a part of these United Kingdoms and ALSO a part of The British Isles (Britain), in common parlance – A useful item of knowledge should he succumb to the bribes of the EU and have need of finding his way back to his roots when sickened! you rather loftily start your blog ‘a constituent of mine’ yet I can see no constituency that you are seemingly elected to! With regard to the sad despoilment of the countryside in your region by utterly useless windmills polluting the atmosphere with the huge amount of energy used to make them and the environment with their vibration and damage to the soil not to mention their catastrophic effect on some species of birds and all to no positive gain save as alarmism. I am surprised you feature such a sad sight as your picture when just one discreetly placed Nuclear power station could more efficiently and much more safely supply the electricity needs of all of Northern Ireland and at times leave spare capacity to export to Eire. You then continue with your rather inept comments on border control on a planet where population has more than tripled since 1945 and economic migrancy is becoming endemic – perhaps you can explain in what way open borders and the resultant invasion and destruction of culture can benefit a Country – ANY Country! You seem blissfully unaware of any of the facts that might justify your aspirations to one day represent people. Perhaps a quick glance at the catastrophic effects of EU membership on Eire might help you understand perhaps even the simple fact that due to EU utter incompetence and centralised greed the obscene implementation of The CAP & CFP has rendered not just Britain but all of EUrope unable to feed itself and not content with destroying third world farmers with EU agricultural subsidies the EU is now stealing the fish from the mouths of Africans by fishing out and destroying fish stocks in the bite of Africa – as it has already done with the fish stocks of the waters around these United kingdoms. You make no mention of the farcical contrivance of The EUro that has, together with the utter incompetence of economic illiterates bankrupt Ireland – now left with no ability to make a meaningful decision on anything and Britain close behind with a National debt of £4.8 Trillion – a sum that can NEVER be paid off let alone sustained in compound interest. Do you hate your EU Region so much you would lead them ever deeper into the mire. Do you really believe politics is the right place for you? The disastrous effects of British politicians selling Britain into the thrall of foreign rule of The Franco German axis of the EU for their own personal rewards has damaged the well-being of Britain more than the armies of Hitler and the Franco – German – Italian axis of 1939 – 1945. Previous Previous post: #G0399* – 09-Jan-2011 – Telegraph – Has William HAGUE Been in Panto? Next Next post: #G0401* – Margaret THATCHER on Consensus – aka Coalition?